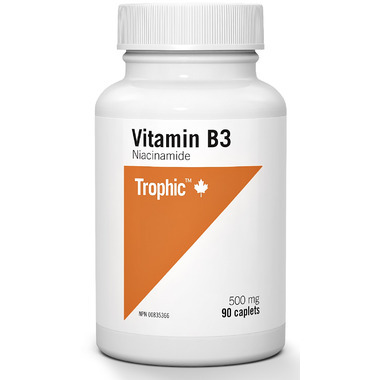 Trophic Vitamin B3 has 500 mg Niacinamide per caplet and does not produce the characteristic niacin flush. Directions: Adults, take one caplet daily or as recommended by a healthcare practitioner. Recommended Use: Helps normal growth and development. Helps the body to metabolize proteins, fats and carbohydrates. Non-Medicinal Ingredients: Microcrystalline cellulose, dibasic calcium phosphate dihydrate, magnesium stearate, silica, croscarmellose sodium.